Thanks to a generous donation from our very special and caring friends Evelyn and Marc Gutchell, adoption fees will be waived for all cats age 8 years and older. Old friends make the best friends, and we hope you’ll come meet some of our wonderful senior cats. 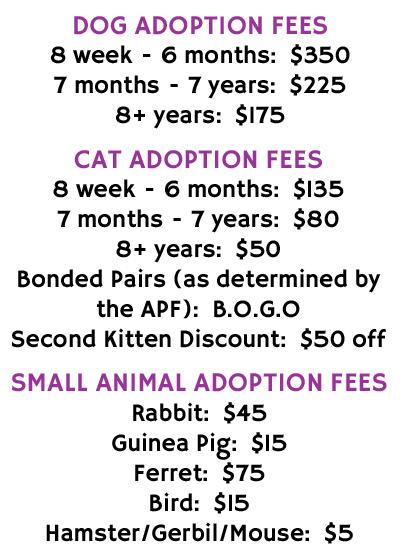 The APF provides the opportunity for seniors age 60 and older to adopt a cat or dog that is at least one year old at a $50 discount. All we ask is to take a photo of the adopter and their new pet at the time of adoption. Senior adoptions are supported in part by a grant from the Pets for the Elderly Foundation. Additional donations are always appreciated. Pets for Patriots is a 501(c)(3) organization dedicated to connecting homeless pets with military personnel. Service members are eligible at any stage of their careers – active, reserve, inactive reserve, retired or veteran – and from any branch of service. The organization supports adoption of dogs or cats at least two years old, large dogs over 40 pounds, as well as special needs dogs and cats. To ease the costs associated with pet ownership, member Patriots who complete eligible adoptions through our shelter will receive access to reduced cost veterinary care, food and supplies. Service members must first apply through Pets for Patriots online and provide proof of military service. Approval takes only a day or two, after which the adopter can visit the APF to meet their new best friend. For more details, visit www.petsforpatriots.org.